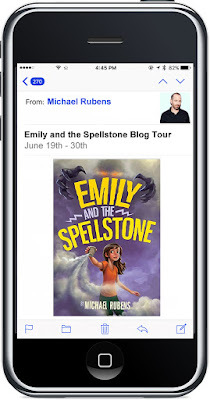 Welcome to Day #4 of the Emily and the Spellstone Blog Tour! To celebrate the release of Emily and the Spellstone by Michael Rubens (6/13/17), blogs across the web are featuring exclusive content from Michael and 10 chances to win a copy of Emily and the Spellstone, as well as a Grand Prize Giveaway! Emily doesn’t have a need for any such services, and nor do it. But if I did have such a servant, here are three things I’d have him do: 1. Clean the apartment. Like, a really thorough cleaning, lifting up all the furniture, scrubbing the walls and ceiling, taking a brush to all the grout between the bathroom tiles. Oh, I’d also have him do the laundry. This may sound like a boring, unimaginative assignment to you – after all, this creature could literally move mountains – but I think I’d rather have a really clean floor without having to do it myself. 2. Ride him to school. This one actually comes from my ten-year-old daughter. When I asked how she thought other people might react if they saw her getting a piggy-back ride from a giant demon-like creature, she agreed that might cause some problems, but also noted that we live in Brooklyn and the inhabitants are pretty used to seeing weird stuff. 3. Speaking of living in Brooklyn, I would have him sit on the stoop at night, waiting for horn-honkers, loud-music-players, and motorcycle-revers, at which point he would approach them and very politely and very cheerfully -- but very firmly -- request that they keep it down. Stop by Positively Book Crazy tomorrow for day #5 the tour! 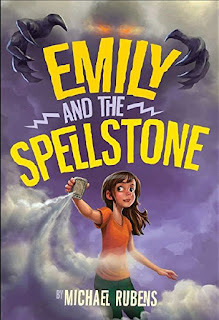 Emily picks up a stone that looks like a cell phone but has unexpected magical powers. It's a Spellstone! Now that she has become an unwilling Stonemaster—one who wields the power of the Stone—she has to figure out Spellstone technology fast if she is to survive a hair-raising adventure among giant dogs, demons, clones, mean girls, and deeply wicked people who want the Stone. A witty tale of a quiet girl who discovers she's a hero when she needs to be. Stonemasters rule! About the Author: Michael Rubens is the author of two YA novels, Sons of the 613 and The Bad Decisions Playlist, and one novel for grownups, The Sheriff of Yrnameer. 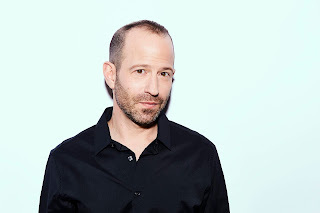 A correspondent and producer for Full Frontal with Samantha Bee, he has also been a producer for Last Week Tonight with John Oliver and The Daily Show with Jon Stewart. His writing has appeared in places like The New Yorker’s Daily Shouts, Salon and McSweeney's. He lives with his family in Brooklyn. Visit his website at www.michaelrubens.com. One (1) winner will receive signed copies of Spellstone and Michael’s 2 YA novels, Sons of the 613 and The Bad Decisions Playlist, as well as a custom Spellstone phone case! Middle grade is so much fun to read.